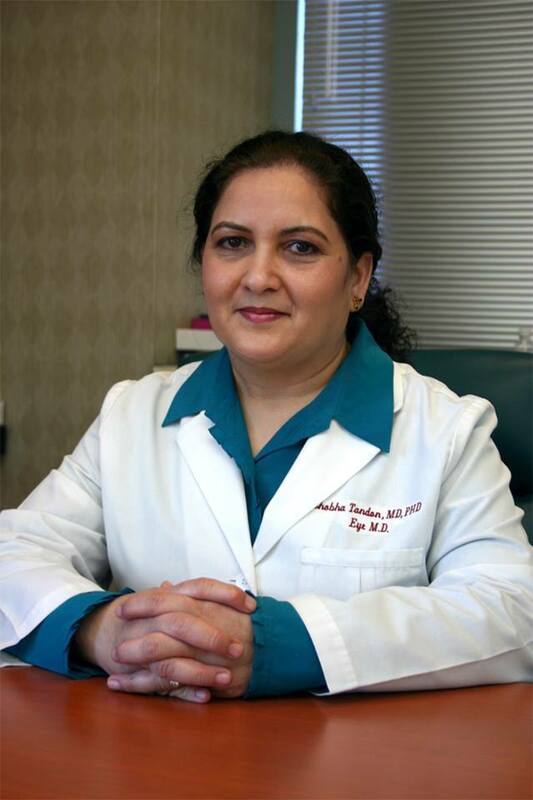 Our medical director, Dr. Shobha Tandon, MD, PhD, is a highly trained and well-respected board certified Ophthalmologist and LASIK surgeon with over 18 years of experience. She was voted “the Ophthalmologist of The Year” by the Consumer Research Council, awarded Honors by America’s Registry of Outstanding Professionals, and was recently named one of America’s Top Ophthalmologists by the Consumer Research Council. Dr. Tandon completed her residency training, as the Chief Resident in Ophthalmology, from Stanford University, after receiving her double doctorate degrees in both Medicine (M.D.) and Biochemistry (Ph.D.) from the University of Texas Health Science Center at San Antonio. Dr. Tandon is a published author in multiple peer-reviewed articles in scientific journals of the highest international repute and the recipient of numerous awards and scholarships, including The Mead Johnson Award for Excellence in Research, The National Student Research Forum Award, The Wallace McNutt Award for the highest achievement in Gross Anatomy, Dean’s Scholarship, The Texas Legislative Merit Scholarship, The Bowen Vogt Medical Science Training Scholarship, and The Wooley Memorial Scholarship. Dr. Tandon is a member of the American Academy of Ophthalmology (AAO), International Society of Refractive Surgeons (ISRS), American Medical Association (AMA), American Society of Cataract and Refractive Surgeons (ASCRS), and American Association of Physicians of Indian Origin (AAPIO). Beyond her active medical practice, she regularly volunteers her time with various non-profit organizations to serve the needs of the underprivileged by sharing her expertise in surgical and medical eye care. She also has a special interest in improving eye care services in developing nations.